Yet another debate by members of FlyerTalk over the proper etiquette pertaining to window shades aboard airplanes was launched back on Thursday, November 17, 2016 — and it became contentious enough for the discussion to be closed only two weeks later by a moderator to further posting of content. The topic of window shades has been — and remains to this day — one of the most controversial topics amongst frequent fliers for many years and has caused as much angst as the debates over armrests and reclining seats: who gets to determine whether the window shade is raised or lowered? Window shade etiquette–what should I have done? Is it rude to open your window shade on an international flight? Why can’t you keep the window shade shut when everyone is sleeping/watching movie? Aisle sitter closing window shade? Can FA demand the window shade be closed? Window Shade Have to be Down in Exit Row Embraer? Who “owns” the window shade? Whose window shade is it anyway? UX: Window shade up for landing? American Airlines Exit row window shade policy/requirement? Why do window shades have to be up for landing? Why do so few people look out the window of the plane? Before I impart my 8 guidelines to the great window shade debate, we must first explore some of the reasons as to why this debate is so contentious. Some people believe that certain passengers who occupy window seats are selfish because they like to keep the window shade fully opened during a flight at all times when fellow passengers work on their computers, use the in-flight entertainment system, or attempt to get some sleep — especially on long-haul flights — while there are other people who do not like the idea of sitting in a dark cabin aboard an airplane for many hours while the sun is shining during a flight. 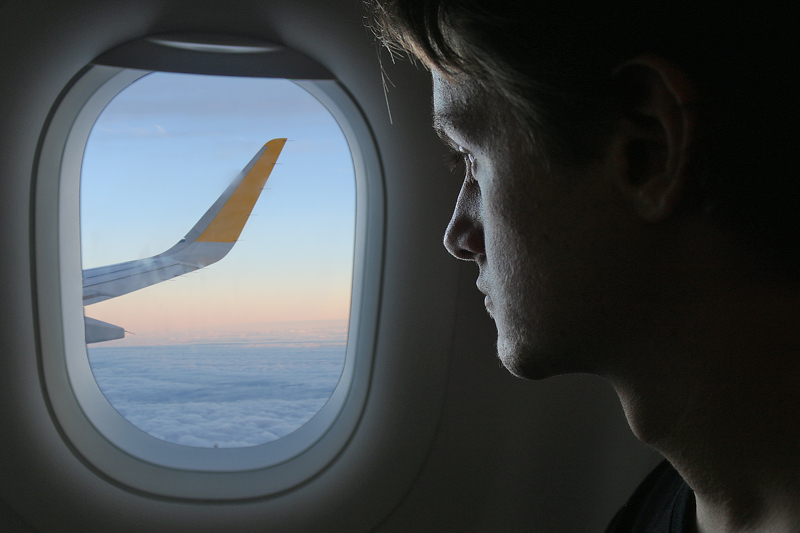 There are claims that natural sunlight can be used to help avoid “jet lag”; that watching the horizon can help alleviate motion sickness; and that choosing a window seat helps to mitigate aviophobia, which is a fear of flying — all of which apparently require keeping the window shade open as the solution. So who really decides if the window shade is up or down? Does the passenger seated in the aisle seat have a right to demand to the person seated next to the window that the window shade be raised or lowered? Does a fellow passenger seated either in an aisle seat or in the seat behind you have a right to reach over and either close or open the window shade next to you if you were seated next to the window? If someone did that, what would you do? This debate can be moot if a member of the flight crew is the ultimate arbiter as to whether or not the window shade should be raised or lowered and when — perhaps due to the official policy of the airline or of a government — and the reason is primarily for the safety of everyone who is aboard the aircraft where in the unlikely event of an emergency, members of the flight crew need to decide as quickly as possible from which side of the aircraft is the safest to exit. If the window shades are open during takeoff and landing — the critical times of when an airplane is most likely to be involved in an emergency situation — members of the flight crew can immediately use that visual access to assess the conditions outside and be better informed when determining what needs to be done in terms of safety as well as which exits to use. Passengers looking out the window could see if something goes wrong out there — for example, if smoke or fluid emanates from one of the engines — and report any anomalies immediately to members of the flight crew. At nighttime, window shades are open and lights throughout the cabin are dimmed as it potentially helps emergency personnel on the ground outside to determine what is happening on the inside of the airplane if something is wrong. While the aircraft rests at a gate during the boarding process, sometimes window shades will be purposely lowered throughout the aircraft during the summer to minimize the building up of heat inside the aircraft and conserve energy; while at other times the window shades are fully raised. Some airlines — such as Emirates Airline as one example — have aircraft equipped with automated window shades; while the Boeing 787 “Dreamliner” aircraft series is equipped with windows which automatically dim. Before I travel, I choose my seat wisely. If the flight is not that long and is on a route where I have seen the scenery multiple times — and leaving the aircraft sooner is my priority — I will select an aisle seat. If, however, the flight is on a long route where I might want a wall to rest my head and where I expect to want to look out the window, I will choose a seat next to the window. 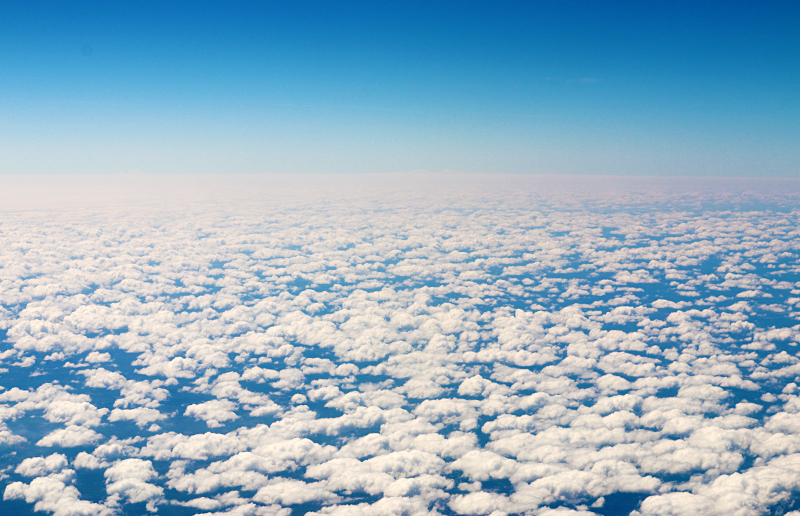 I have mentioned numerous times in the past — such as in this article pertaining to the possibility of windowless airplanes in the future — that I typically enjoy sitting in the window seat aboard an airplane during a flight. I personally think it would be a drag to fly in an aircraft without windows. I was fortunate to have flown as a passenger on Concorde operated by Air France; and I enjoyed seeing the curvature of the Earth outside of the window — which was heated due to the friction caused by flying at almost twice the speed of sound — from an altitude of 60,000 feet above sea level. Looking southeast towards Atlanta. Photograph ©2015 by Brian Cohen. For me, the view outside of the window of an airplane is my in-flight entertainment. It is an opportunity to witness the miracles of nature and the tenacity of mankind with a view unmatched and unrivaled by terrestrial means — even being at the top of the tallest building in the world — with the cities built and the ribbons of highways on which tiny metal cars traverse. I truly enjoy the transformation of our wonderful planet evolve before my eyes — aided by the combination of the rotation of the Earth with the jet propulsion of the metal tube in which I am seated — and view the wonders of nature: from majestic mountains to billowy clouds in all sorts of different formations; and to see a sunset or a sunrise from the air is an especially magical treat to enjoy and embrace. …unless I am over some vast expanse of water — then all bets are off on that one. The cloud formations then take over my attention — if there are any clouds present in the sky, of course. I am awed by just how deep blue the color of the sky can be; and at night, I enjoy watching the stars seemingly so close that you can just reach up and grab one. Thunderstorms below give the impression of flashes from the cameras of a thousand photographers under a veil of puffy cumulonimbus clouds. Complemented by the music to which I enjoy listening while in flight, I am truly mesmerized and entertained. The window on an airplane during a flight is my favorite mode of in-flight entertainment. Then again — as illustrated by a few examples listed below in this article — fellow passengers may have valid reasons for needing to have the window shade raised or lowered. Perhaps a brief discussion is necessary whenever there is a debate over whether the window shade should be raised or lowered so that a compromise can be reached — assuming that the parties engaged in the debate are reasonable, of course. While most people would agree that the middle seat has more disadvantages than either aisle seats or window seats, each have their own benefits and disadvantages — but for this article, the focus is only on window seats. One disadvantage is when a window seat is assigned to a passenger — except that the seat has no window next to it because it is apparently hiding some functional or structural element of the fuselage behind it. However, I have managed to look on the bright side and find at least one advantage to having a window seat with no window next to it: smooth support is provided to rest a weary head when attempting to sleep during a flight — although one does have to consider the possibility of the pillow sliding down the slope of the wall due to its angle and smoothness. I elaborate on this advantage in greater detail in this article pertaining to the one benefit of a window seat with no window. Another disadvantage is when a passenger who is seated in a window seat is sitting next to two passengers who do not leave their seats for the entire flight, as has happened to me on a flight from Atlanta to Amsterdam on my way to my final destination of Helsinki. …but on this particular flight from Atlanta to Amsterdam, neither of the younger or older male passengers left their seats at all — not once for the duration the flight, which was approximately eight hours and 20 minutes. Not to use the lavatory. Not to stretch their legs. They became “camels” — which is a term I coined for them on the spot during that flight due to their endurance of never needing to use the lavatory from departure gate to arrival gate. That had never happened to me before — or since. If I am sitting next to the window, I believe I have the ultimate say as to whether or not the window shade is raised or lowered for the aforementioned reasons — but that does not mean that I should be inconsiderate to my fellow passengers. Of course, this guideline is always superseded by orders from members of the flight crew. The economy class cabin just as passengers were boarding the aircraft in Amsterdam. Photograph ©2014 by Brian Cohen. Depending on the situation, I will politely ask a fellow passenger in a neighboring seat if they would mind my raising the window shade. Typically, that passenger usually responds that he or she does not mind and is appreciative that I asked first. If the sun is shining brightly into the cabin and causing a blinding glare — especially directly on the face of someone else — I will lower the window shade either completely or at least enough to eliminate the potential discomfort of fellow passengers. Unless there are some really spectacular cloud formations or other interesting views outside, I will leave the window shade partially open instead of completely open so that I may admire the view below; and I often like to watch the view while listening to music which I believe is appropriate for that moment — such as the 1976 song Breezin’ by George Benson while viewing the clouds and the blue sky. If fellow passengers are attempting to sleep or use their portable electronic devices or in-flight entertainment systems, I will keep the window shade closed unless I specifically want to look out the window or want a little natural light — and then, I will raise it just enough for me to enjoy the view with minimal disturbance to fellow passengers. In fact, I will usually lean forward and block the opening to further reduce any glare while I can still fully enjoy the view. Settling in near Lake Lanier. Photograph ©2015 by Brian Cohen. If I notice a fellow passenger craning his or her neck to see out the window from an aisle or middle seat, I will attempt to give him or her as much of a view as possible — whether it means completely raising the window shade or leaning back so as not to obstruct his or her view. If I find that a fellow passenger is really interested and I am knowledgeable pertaining to what is outside — such as sights around New York prior to landing or after departure — I will point them out to him or her; and that person is usually appreciative enough to ask further questions, which I am more than happy to answer. Of course, discretion needs to be exercised if the fellow passenger would rather be left alone. If I am seated in an aisle seat and want to look out the window, I may place a polite request to the person occupying the seat by the window to open it — but this is quite rare, as I usually select the seat I want before the flight. I will also let the person know when I am done looking out the window. As I have repeatedly posted in past articles here at The Gate, politeness and respect to others go a long way in keeping as many people happy as possible — including yourself. Compromise and patience are key — and the debate of the window shades is no exception. I first briefly discussed the debate pertaining to window shades in a humorous manner back on Wednesday, June 6, 2007 here at The Gate — when I first asked the question Do passengers seated by a window have a right to be shady? — with a brief follow-up article back on Friday, July 15, 2011; and this article pertaining to the seven guidelines to the great window shade debate back on Thursday, April 23, 2015. Now it is your turn to please shed some light on this topic with your thoughts: how would you end the airplane window shade debate once and for all? All photographs ©2014, ©2015, ©2017 and ©2018 by Brian Cohen. I realize that it’s critical to observe certain social niceties aboard an airliner. Among these is closing the shade when lights are dimmed, so other people can sleep. Just doing as I wish because I wish it is the same as playing music loudly while aboard regardless of what anyone else thinks. While it would be lovely to be more important than everyone else with them acceding to my wishes, I’m not that important and neither is anyone else, so we have to do what’s best for the group for a few hours while we get where we’re going. I have perhaps never read an analogy as bad as: looking out a window is the same as playing music too loud. He who pays for the window seat gets to look out the window. It’s that simple. The idea of letting a few flying vampires order the rest of us to not look out the window is comical. You just have to get out more of that’s the worst analogy you’ve ever heard. The difference between you and I is that I don’t feel entitled to bother lots of other people because I’m more important than them.